Having consistently written of my profession and perspective during my three years or so of blog writing in a way almost designed to scare young lawyers away from starting up a practice in a small WV town, I am confronted with one who appears to determined to do it the hard way. I have guided her to my blogs, “WV Lawyer – Tips and Techniques”, www.burtonhunter2esq.blogspot.com and my original and primary blog www.burtonhunteresq.blogspot.com , and I think she has actually read some of it. Maybe not. She did have that little thing called the Bar Exam, and a knee operation! But, she passed and healed, and now says she is ready. Yep, she is going to jump straight from law school and the bar exam to “hanging out my shingle”! A shingle of course is your name on a sign, a bit like “The Pig and Whistle” and “Durty Nellies” if you are an English or Irish pub. Rather than list the reasons this just can’t be done, I want to be supportive and very helpful. After all, if you could help caulk the seams, or contribute some extra padding, to a person going over Niagara Falls in a barrel, you would wouldn’t you? 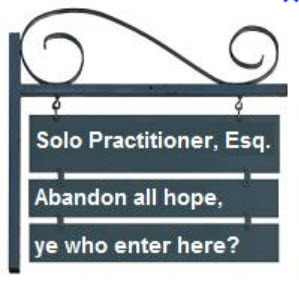 Actually I have met two such persons recently, but the other attorney is a bit more experienced and has a method of transitioning from a related job to full time legal practice. The pure “hanging out a shingle” successfully, right out of law school, is a rare and challenging feat. My tips for establishing a practice almost certainly cannot be followed in their entirety. In order to do that, the young lawyer would probably have to give up thought of making any profit the first year and invest $50,000 and 60 hours a week (or more), six days a week. But, anything less than that can add years to the process of being a fully producing, experienced, lawyer. Did I mention even 2-3 years in a well run firm would be invaluable? My start as a WV lawyer was with a husband and wife firm, and a year and a half later, taking over a senior lawyer’s office for the year he rehab’ed from heart surgery. In each instance there was an office, staff, equipment, and a clientele. I had four years experience as an US Air Force assistant judge advocate. That was a tough job, so I had been seasoned and hardened, but I had a lot to learn and unlearn. I had never encountered a person so formidable as the Hon. (circuit court judge) William L. (Les) Fury. But that’s another story. You can find my name frequently in reported cases appealed to the WV Supreme Court of Appeals. 1. Read the fall 2012 edition of WV Lawyer, the WV State Bar Magazine. There are features on five WV Lawyers, one a woman, with 250+ years of combined experience. Not much practical advice, but much on character, ethics, dedication, and compassion. Except that Dan Callaghan of Summersville, who has two lawyer sons, urges the young lawyer to start out with a firm to support her. Ouch. I promised I would be supportive and helpful. 2. I hope the young lawyer has great grandma’s inheritance, the help of family, or recent lottery winnings, because the days of opening a store front with an I.B.M. Selectric typewriter are over, unless you are committed to a career of limited productivity and living off of the court appointed system until it dries up, and it is going to dry up. I say this, because in this time of fiscal drought, who wants to provide free legal help to poor crooks or juveniles? Their lobby ain’t that big. 4. I recommend that last one too. Those $500,000.00 to $2,000,000.00 in fees may come in handy! a. Go interview other successful lawyers in a firm or practice like the one you hope to create. Interview women and men. 6. On the theme of not burning your bridges behind you, I just took an oral history of Bill Dean of Wheeling, now Cincinnati, my old Sunday school teacher, now retired. He must have had 20 jobs in his life, and virtually all of his employers told him he still had a job if the new one did not turn out. Now THAT’s a knack. He never had a day without a job to go to. 7. If you have not become a master at technology as a high school, college, or law student, that’s a shame, and it will be a distraction. The “rap” on women of course is they do not like science and technology. Well, guess what? At the very least, current technology will double your productivity. Ignore that and you and doomed to second rate status and productivity. If women are as good, or better, than male lawyers, they have to be as good or better in technology, office management, and marketing. a. Two powerful, ultralight, wide screen Windows 8 laptops. I know, Wire Magazine has declared “the end of the laptop”, but they will last the next five years, and that’s essential. b. Why two? One for you and one for your assistant. You MUST budget for a good assistant. I have often trained recent h.s. graduates, but you really cannot afford to have a novice working for a novice. c. It is the redundancy that is key. If you are “in the cloud” as I envision, you can drop your laptop down the stairs, snag your assistant’s the next day, replace hers, and never miss a beat. If you have everything on one computer, and no backup, you WILL find yourself with nothing some day. Be like the Duffield firm in Huntington that had a devastating fire and never missed an appointment or a hearing. Fire on Friday; new office open on Monday. That’s impressive. d. Have plenty of insurance, malpractice, commercial, auto, home, medical, and an umbrella. Why an umbrella when you are just starting out? What if the guy who injures you has little or no insurance? You may be in a hospital for months, or, worse, at home with no insurance, for months. There is no guarantee a lawyer cannot become homeless. d. Find a local lawyer who has great paper forms and system and “borrow” his. Ask, and you shall receive. Divorce intake, caretaking functions, financial affidavits and worksheets, object list sheets, “how did you find me” form, regular intake, various handouts, etc. A good lawyer has dozens of such forms and happily shares. e. Lawyers do not have libraries any more, and the Upshur County Law Library has never been much. You can drive to the WVU Law School. I did that for EVERY big case, and it was a lot of fun. The WV Manual prepared by the young lawyers section of the State Bar is outmoded, but take mine home for a month and look over its various practice areas. Scan it if you would like. The Bar no longer sells it, and it is sorely missed. Of course, in WV we have Fastcase, so the case law and statutory law are available, but I love the “how to” stuff. f. If you can find a friendly lawyer who remembers when lawyers had libraries and still has even an outdated practice oriented library, camp out there. Never take on something new without surveying the law, and using the checklists of Am Jur Practice and Pleading Forms, Proof of Facts, or Trial. These checklists provided what you cannot do with common sense or theoretical learning. g. Speaking of checklists, I just read, “The Checklist Manifesto” by Atul Gawande, and a couple other books with similar ideas. I love “Scrolling Forward”, the history of the document, and The Information by James Gleick. Checklists, systems, and forms should be at the heart of every efficient, productive office, airline, or operating room! Record your policies and procedures as you establish them, and require new employees to study them. h. If you simply ask, there may be a lawyer who has lots of document digital forms and templates. Get them and use them. i. If you know an experienced lawyer with a detailed office “Policies and Procedures Handbook”, even if a bit tattered and needing an update, get a copy. h. Since “templates” leads me to thoughts of technology, let me return to that theme. You have an advantage over the lawyer of 40 years experience in that he has an accumulation of things he has been building on, changing, and jury-rigging for decades. For example, my billing system still has the appearance of a system I created on my trusty Apple II, and some of my spreadsheets and systems started in Visicalc (spreadsheet), Appleworks, and Microsoft Works. i. You have a clean slate! a. NEVER save a client’s paper file; return it or, with permission or lack of response from the client, shred it. I have 5000 paper client files. It is a HUGE job we have just begun to tackle. Scan all documents as they come in, and you will never face my problem. b. Do not bother with a shredder. Have a bin in the office, and have a bonded company come through each month, take the bin, on wheels, to their truck, and shred it all. All your staff does is drop the documents into the slot. You never have to pay for or fix a schedder. c. Have a multi-function printer, copier, fax, (color) scanner, and have a Fujitsu Scansnap S1500 (or whatever the best current model is) scanner on your assistant’s desk, yours, and your home office. They are the size of a loaf of bread, but not portable. They come with Adobe Acrobat Standard, current version, a $200 product, and cost just $400 each. We have six of them. A recent review from Technolawyer said that tank manufacturers should contact Fujitsu to see how they do it. d. My multifunction machine is a monster, very powerful and pricey, but, according to Brian Cluxton of HMU/Affinity Consulting in Columbus Ohio and other locations, it is no longer needed by a sole practitioner. Rather that get a $30,000 Toshiba Studio, etc., Brian says a Brother Multifunction, less than $1000, will do the job. That’s @ $2000 for all your printing, scanning, and copying needs! e. Consider doing what I did, but more comprehensively since you are starting out. Have Brian interview you and identify your needs and your goals. Let’s him spec out the laptops and their features, other equipment, and host you in Microsoft Outlook. Since you don’t yet have an office full of equipment, he probably will not need to camp in your office for two days as he did ours. Maybe you can just go to his office in Columbus; better yet, he will commicate by controlling your computer remotely. f. What does “host you in Microsoft Outlook mean? It means that your Outlook will be “in the cloud” so your calender is on your laptop, your secretary’s (I mean assistant/paralegal), your ipad, and your iPhone 5.
g. That’s right. You must have a new iPad and iPhone. Here’s why. The better trial lawyers have begun to use TrialPad or other applications for use in court. You must have wi-fi and 4G. You must be able to project a document, photo, or other visual onto a screen. You must have all the data in your office in your fingertips. Yes, you must! How sad to see a senior, or even younger, lawyer say to the judge. “I do not have my calender your honor. May I call my secretary?” Although the phone is supposed to be off, the judges, for now, say “all right”, but what about when the secretary is in the restroom or gone for the day? Sometimes the judge asks, “How come you do not have a smartphone like Mr. Hunter’s?” How embarrassing! h. You MUST have this technology, because for five years it will give you an edge, and boy do you need an edge if you are flying without a parachute! i. And, in five years, everything I say here will be the norm or passe’. You will be fighting for that edge your entire career. I am the last of a breed that can still see strong similarities between my office and the one I walked into at Griffiss A.F.B. or Rexroad and Rexroad. At the end of your career, the office will be unrecognizable. You will be in a “virtual world” where miracles (by today’s standard) are normal, and peoples’ average retirement age is 80 or more and life expectancies are 120 or more. j. How did I take so long to get to document assembly? It will be at the heart of your office. I have already written about my preference for Pathagoras over HotDocs. Just search my blogs for “Pathagoras”. My question is, if you can double your document production and efficiency with Pathagoras, digital records, and Dragon Naturally Speaking, why in the world would you not want to? k. And, and I hardly dare go here, but if you are one of the lawyers who operates without a staff (Yes, there are lawyers living off of the court appointed system [which we must assume will soon leave us] or doing things like title work or deed preparation, who do not have a staff. While I think doing without a staff, or a “guy Friday”, is nuts, the only conceivable way I could see it happening is with technology. l. A reason it really cannot happen is how do you track your money, market yourself, handle billing, especially the detailed bills required by the state, and AVOID MALPRACTICE, without someone to back you up. m. I am near the end. One thing I have been stumped by is that it will cost me more than $10,000, maybe 20 to switching to a practice management, billing, accounting suite. I use a Microsoft Access database (converted from an Appleworks format) for billing, another for client lists, Quickbooks Pro for accounting, and Microsoft Outlook for calender, tasks, and contacts. Call Britt Lorish of Affinity consulting and see if she can’t get you set up for a small fraction of that with a practice management suite. You do not have 200 current clients or 5000 closed files as I do. This will pay vast dividends. o. If you do not go and hang out with them, how in the world will you know who the best lawyers in WV are? Guy Bucci, Tim Bailey, Jim Bordas, Marvin Masters, Jim Fitzsimmons, or a specialty lawyer like C. Michael Bee for his brain injury expertise, or Vince King, the “Insurance Guhru of WV”. In my era it was the great Stanley Preiser, Charlie Hughes, and many others. Charlie had the index for of all WV insurance cases before Westlaw and Fastcase arrived. That stuff was critical. Vince found my clients an extra $1,200,000.00 in insurance coverage! You will see a lot of bad trial work in a rural setting. (That is the subject of another article.) Go to seminars taught by the best in the business, state, and nation. How else to see people like Melvin Belli, Race Horse Haynes, Barry Scheckt, F. Lee Bailey, or Howard Nations? p. Go to seminars, at least 3 times the mandatory number of hours per year, in your primary subject areas, and areas you do not practice, like bankruptcy that you need to know something about it. If you have a lawyer with 200 seminars carefully indexed, get his database, and go there frequently. That stuff is a gold mine. q. Try to figure out where you can make some money, but for awhile you will have to be a master of many areas. In the long run, that’s impossible. You will be drawn in some direction and will have to “go with the flow”. It has been a long week, so until I edit and streamline this, it will have to do. One more tip; if you really want to know what kind of law to practice, or whether to practice at all, travel to Atlanta and take two the two day battery of classes at the Johnson-O’Connor vocational testing center. It’s @ $600, and perhaps the best $600 you ever spend. So Sorry to forget. Go to the vast library of The Law Works on WB Public Television! Good blog Burt, even for those of us just on the sidelines. What app/program do you use for your deposition transcripts?